Jesus and His disciples were on the road to Jerusalem where Jesus’ opponents held power, and He began to tell them what was going to happen to Him. Jesus was telling His disciples that He would be condemned to death, mocked, scourged, spat upon and finally killed; and He prophesised His resurrection when He said, “after three days He would rise”. Having stated these major events, His disciples (the apostles), rather than give Him some kind of feedback with reference to what He was saying, rather than engage with Him on these significant topics and predictions, His disciples totally ignored what He was telling them. They seemed distracted and blinded by the selfish ambition in their hearts. Rather, they asked Him a question in relation to their selfish motives, saying, “Teacher, we want you to do for us whatever we ask of you”, and He said to them, tolerantly, since He could read their hearts intention, “What do you want me to do for you?” And they said to Him, “Grant us to sit, one at your right hand and one at your left, in your glory”. What their question indicates is that the disciples, even these close followers of Jesus, have failed to understand Him (that is, the gospel message). They thought that the whole purpose of going to Jerusalem was to gain political power. They had dreamed, as most of the Hebrews dreamed, of a coming king of Israel who would set Jerusalem free and establish His kingdom on Mount Zion, and in righteousness rule the world. And they thought of Jesus as this kind of king. And they were saying; “Now when you establish your kingdom, let one of us sit on the right hand and the other on the left hand of your throne”. In other words, they were seekers of personal glory, they wanted to feel important. It seems that they suffered from a vain grandiose vision of themselves (a superiority complex), even His disciples! In a sermon on this text, the former leader of the African American human rights movement, Dr. Martin Luther King, Jr. pointed out a human condition, a human tendency that he named “The Drum Major Instinct”. The term is a metaphor of pride or superiority (The Drum Major is somebody who leads a marching band, a leader and conductor who moves a baton up and down and twirls it rhythmically). The Drum Major Instinct, King explained, is the need to be out in front, at the head of the parade; the need to be the center of attention. This “drum major instinct” is the “all about me” as we call it today. Instead of taking into consideration the needs of others, the concerns of neighbour or community, world, or creation, we go astray and focus just on ourselves. The “all about me” is this “drum major instinct,” the “I want what I want when I want it.” The way King described it, we might quickly ascribe this condition to only the extroverted sisters and brothers among us, but this “drum major instinct” is just as much a condition experienced among our introverts. That the world revolves around me can be just as much about the full attention given to book, to hobby, to self-interest, to alone time. 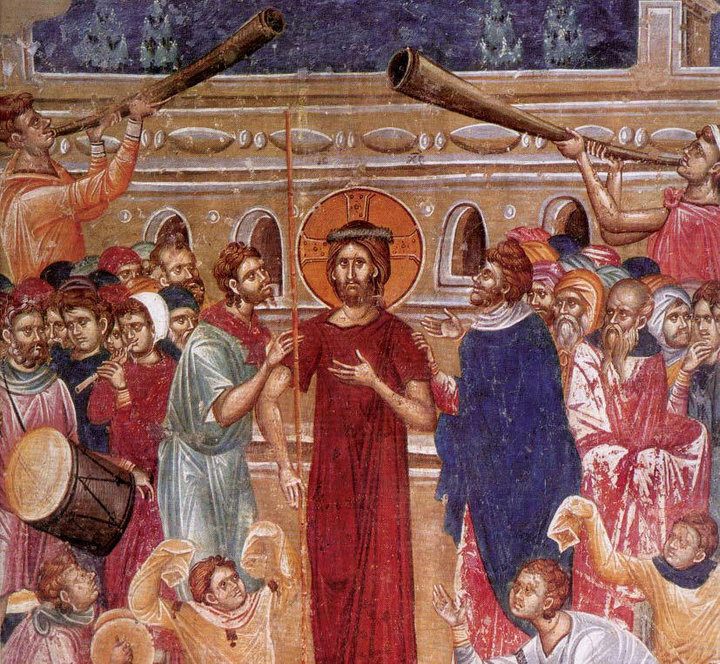 James and his brother John were battling their “drum major instinct” in this gospel reading. They said, “Teacher, we want you to do for us whatever we ask of you”. Jesus, “Grant us to sit, one at your right hand and one at your left, in your glory”. In other words, “Jesus, give us special seats, the good seats. Jesus, let us sit in the celebrity box seat with you, not on the bench seat”. So, James and John are guilty of the “all about me” pretentious complex. “Let us have the good seats”, they plead. Now, we would automatically condemn James and John, and we would say they were selfish. Why would they make such a selfish request? But before we condemn them too quickly, let us look calmly and honestly at ourselves, and we will discover that we too have those same basic desires for recognition, for importance, that same desire for attention, that same desire to be first. The other disciples got frustrated with James and John, and you could understand why, or maybe they too, were envious of the thought of James and John. Nevertheless, we must understand that we have some of the same James and John qualities. 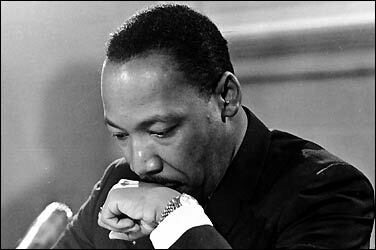 As King accurately said, there is deep down within all of us an instinct. It is a need that some people have to feel superior, divine, a god, a need that some people have to feel that they are first. It’s a kind of drum major instinct—a desire to be out front, a desire to be big, a desire to lead the parade, the ambition to be first. And it is something that runs throughout the whole length of our life. 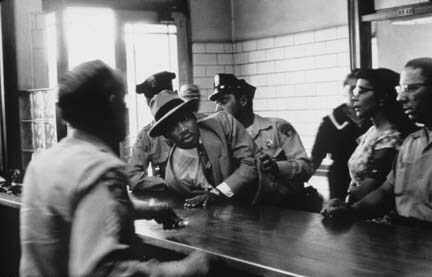 So before we condemn them, let us see that we all have the drum major instinct. We all want to be important, to surpass others, to achieve distinction, to lead the parade, to be praised. In fact, everybody likes to be praised. And somehow this warm glow we feel when we are praised or when our name is printed in the papers or when have copyright control or paten an idea, this is something which feeds our ego, because we can say, this is mine! I had my name on it first, I thought of this first! The presence of this instinct/superiority complex explains why humanity is so often fooled by advertisers, those professional teachers of massive verbal and visual persuasion. 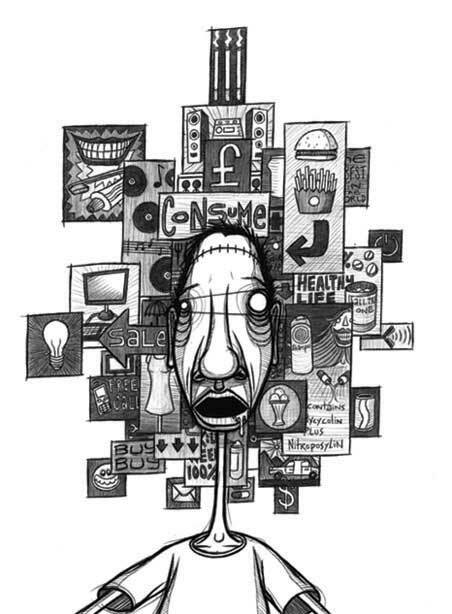 Advertisement today has become so successful because it has tapped into this great human resource of immense capitalistic and utilitarian value, this bottled-up ego called the superiority complex. Pride is like a fire that never gets quenched, the more material you feed it the stronger it gets. Godless advertisers know about this greedy fire in us. That is why they have a way of saying things to you that gets you into buying more… and more…and more. But the only thing that can quench this fire is the water of baptism, and the tears or our repentance. Godless advertisers make you feel that in order to be a man of distinction you must have an asset portfolio with a bank, your lawyer and your shrewd accountant. In order to make your neighbours envious, you must drive this type of car or have the latest mobile iphone, digital cable 2M HD LCD TV, CD, DVD, Mp3 media, with surround sound and internet access. In order to be lovely and to love you must wear this kind of lipstick, this kind of perfume or nail polish and have a perfectly proportioned figure with the latest: body, fat, diet and exercise programme, equipment, and health food. And before you know it, you’re credit card is buying that stuff, but that’s ok because it’s adding up your Fly Buy points! In America, the world’s largest retailer, Wal-mart, raked in $421 billion in revenue last year – that’s enough to buy Bangladesh! They have over 8,500 stores world-wide in 15 countries under 55 different names and employ 2 million people. Now in Australia many businesses from different parts of the market, envious of this kind of success, are following the same tactic of these business giants and so you’ve got in our times, this franchise global manifesto! 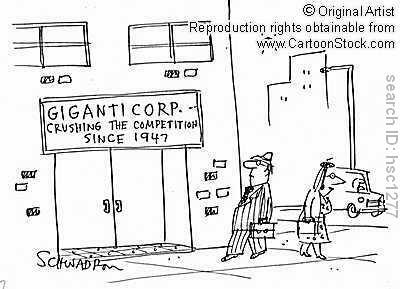 Most industries are now dominated by just a few massive companies, referred to by economists as ‘oligopolies’. 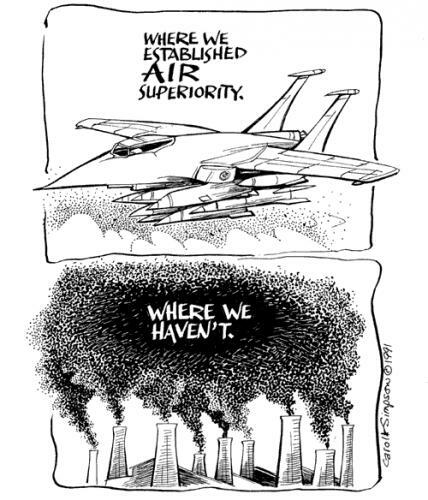 We call them monopolies in the sense that they collectively dominate the economy as a whole. As small companies compete, you naturally get market leaders. 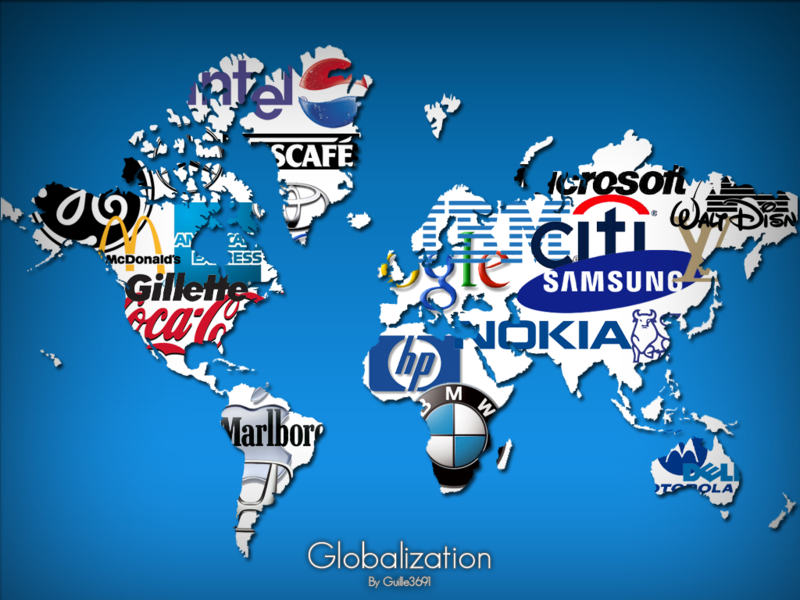 As these companies get larger they become more efficient at producing goods and services. They invest in mass production techniques in order to produce goods more cheaply than their competitors. They buy raw materials at cheaper prices because they buy in bulk. They expand specialisation amongst their workforce. They also copyright and patent their work, preventing rivals from using it. The bigger you get, the easier it is to make money. 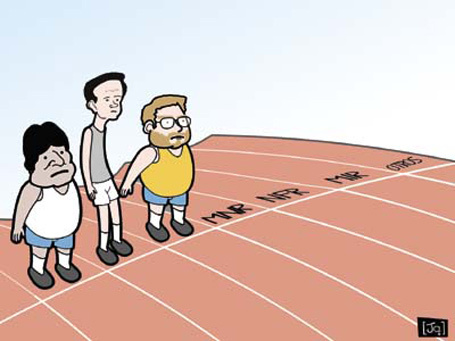 Smaller companies and family businesses cannot compete. If you wanted to compete with Ford motor cars, for example, just one car plant would set you back around $500 million. Now the problem is the drum major instinct. You see people over and over again with the drum major instinct taking them over. And they just live their lives trying to outdo each other and in the process destroying equal opportunities, the climate, cultures, relationships, families and distorting personalities. The drum major instinct can lead to exclusivism in one’s thinking and can lead one to feel that because one has some training, one is a little better than that person who doesn’t have it. Or because one has some economic security, that one is a little better than that person who doesn’t have it. And that’s the uncontrolled, perverted use of the drum major instinct/ superiority complex. So what is Jesus’ response to the disciple’s superiority complex? Typical of Jesus’ conversation style, he responds first with a question. “Are you able to drink the cup that I drink, or be baptized with the baptism I am baptized with?” When the brothers respond that they are able, we assume they don’t entirely know what they are saying. Jesus assures them that they will drink the cup and be baptised as He will be. The cup He had in mind was a bitter one involving crucifixion. What kind of cup does the Lord have in mind for us? For some disciples such a cup entails physical suffering and the painful struggle of martyrdom. But for many, it entails the long routine of the Christian life, with all its daily sacrifices, disappointments, set-backs, struggles, and temptations. A disciple must be ready to lay down his or her life in martyrdom and be ready to lay it down each and every day in the little and big sacrifices required. In other words, Jesus said, “you want to be first, you want to be great, you want to be important, and you want to be significant, don’t you? Well, you ought to be. If you’re going to be my disciple, you must be!” But Jesus reordered priorities. He said, yes, don’t give up this instinct. It’s a good instinct if you use it right. It’s a good instinct if you don’t distort it and pervert it. Don’t give it up. Keep feeling the need for being important. Keep feeling the need for being first. But I want you to be first in love. I want you to be first in moral excellence. I want you to be first in generosity. I want you to be first in gratefulness. I want you to be first in kindness. That is what I want you to do. Jesus said to them that your call is not to be the greatest. Your call is to be servants! Instead of leading the parade, instead of putting on the fancy drum major hat, instead of leading out in front, instead of wanting what they want when they want it, they are to serve as Jesus served. Jesus is the perfect example of what the true drum major should be. He was the one out in front as servant. He loved, He ate with some strange and even controversial company, He, went to the cross and to the grave for the sins of the world. Jesus, as ultimate servant turns the “all about me” complex into a healthier, “all about others”. When we think about Jesus as servant, it’s a different kind of parade. It’s not about the greatest appearance or the greatest program. It’s not about the special seat or fancy outfit. It’s not about the most money or the best tradition. When we see Jesus as our Lord, as our Drum Major, it’s all about service. It’s about sharing Jesus’ type of love. It’s about helping neighbor in need. It’s about welcoming the outsider into the body of Christ. When we know Jesus as God’s ultimate love for us, for all creation, it becomes about service and not about seating. If we’re not the drum majors, if we are to turn around this “Drum Major Instinct”, then what are we to be? This is the life to which Jesus calls James and John. This is the life to which Jesus calls you and me. Not so much drum major, that role has been taken, not Lord and Saviour, more servant and disciple/student. We are called to a servant life. Not a life of “look at me, look at me”. We are called to be the light of the world, a life that proclaims, “Look at Jesus, look at God’s love in the world”. Christ said, “Let your light shine before men, that they may see your Father in heaven” (Matt 5:14). This is what it means to serve the living God. Jesus did the unthinkable! He wedded authority with selfless service with loving sacrifice. Authority without sacrificial love is brutish and self-serving. King rightly stated that Jesus transformed the situation by giving a new definition of greatness. And you know how Jesus said it? He said, “Now brethren, I can’t give you greatness. And really, I can’t make you first”. This is what Jesus said to James and John. “You must earn it” by remaining sober, it’s a kind of humble realism. True greatness comes not by favouritism, but by spiritual fitness, spiritual exercise/asceticism, being in a state of vigilance and preparation for the gift from above. And He said, “…but to sit at my right hand or at my left is not mine to grant, but it is for those for whom it has been prepared”. This is the sort of attitude the desert fathers teach. A Person asked the Old Man Barsanuphius, “So how is it that we find some of the guileless fathers responding in modesty when they are praised?” Barsanuphius responded, “The fathers reached that measure of which the Lord spoke: “When you have done all these things, say ‘we are worthless slaves’ (Lk. 17:10). And in truth, since they consider themselves in this way, they respond according to what they are. 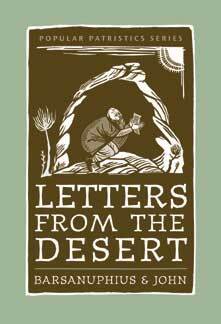 Moreover, even if someone else accuses them of being worthless slaves, they are not annoyed, but they even bless that person as speaking the truth” (‘Letters from the desert’, Barsanuphius and John p. 114). An early church father summed up Jesus’ teaching with the expression: to serve is to reign with Christ. We share in God’s reign by laying down our lives in humble service to our fellow humans and all creation, as Jesus did for our sake, a sacrifice out of love. In this way we honour the humility and True humanity that has saved us, and imitate it in our daily lives. The two readings may not seem to be very closely related to Mary of Egypt, but they are extremely suitable in fact. Mary was a prostitute of 5thCentury Alexandria – a city so immoral that people fled from it to become monks in the Western desert. 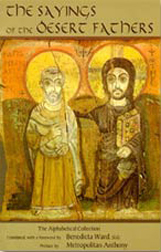 Mary is supposed to have gone on pilgrimage to Jerusalem and to have been prevented by a spiritual force from entering the Church of the Holy Sepulchre; then her mind went to God, when a prick of conscience and awareness of what she had done had an effect on her, after which she retreated to the desert beyond the river Jordan to live in repentance for her long career of sin. It is said that she lived there for 47 years, until she met a priest Zosimus, who gave her communion and then returned a year later to find that she had died. 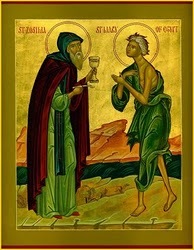 For this reason during the Matins’ service, at the third stichera of the lauds, we praise St Mary of Egypt for condemning her every transgression in the past and for the confidence which she adored the all-precious Cross of Christ, converting her ways to a higher lifestyle. Ἦχος πλ. βʹ. Ὅλην ἀποθέμενοι. earnestly the fine way of virtue. We see in this story that it is never too late to repent; and that the most deliberate sinner may be surprised to discover, the reality of God. 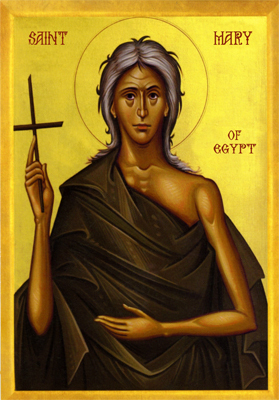 Prevented from entering the great church, St Mary of Egypt changed her life. Perhaps some serious difficulty in a wrong path of life has blocked us from time to time, and this can be for us the refusal of entry to the place of Christ’s death and resurrection, into His peace. But repentance changes everything, and like James and John we discover eventually that the places given to us are those which belong to us by the power of God and not to our ambition. Thus we accept what is our Cross, we repent, and then we live a sober way of life according to the gospel, always ready, hopeful, and open for the grace of God to come and dwell in us.